spring has sprung, as they say, and the spences have been taking advantage of the great weather! 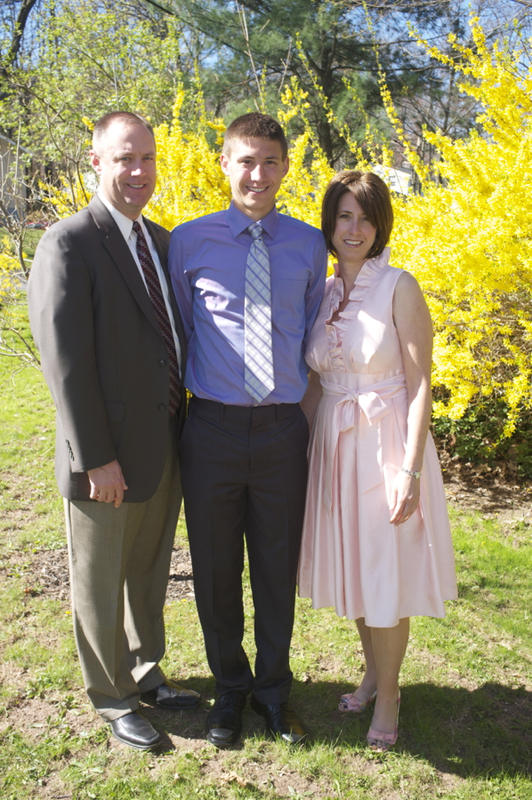 we kicked off the season with a trip to conyngham for easter. the kids were anticipating the weekend for a long time, talking about the impending egg hunt and spending time with nana and pop pop, their cousins, and aunts and uncles. (jackson said one day: “you know what? i think holidays are so fun because we get to see all our family and hang out together.” our thoughts exactly!) 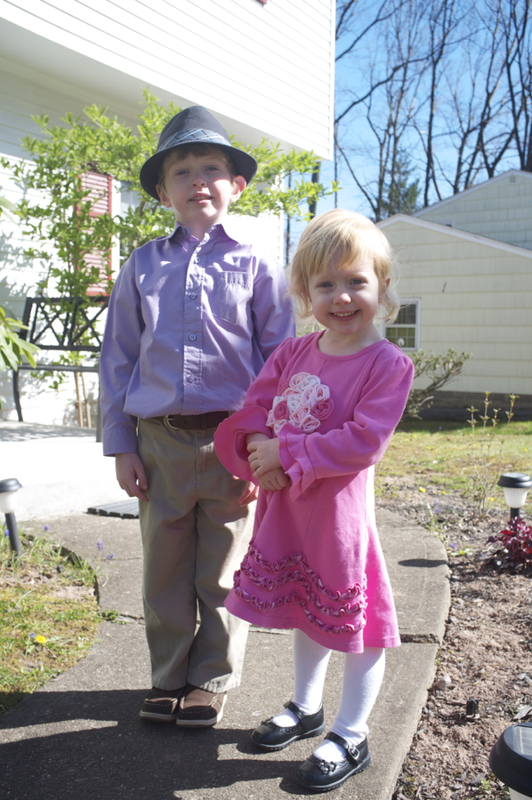 here’s the kids in their easter finest (with a shout-out to aunt lynne for finding phoebe’s adorable dress, which she did not want to take off – ever). we couldn’t resist including this nice family portrait of the fitzgeralds. is it possible that colin has gotten even taller this year?! can’t believe he’s finishing up his senior year of high school. yowza! it took us a while, but we finally made our trip up to the state college area a reality. molly and the kids last visited penn state on labor day weekend. they got to see joepa in person one last time during the friday night pep rally. and jackson was the only spence who got to see an actual football game live, coached by joepa in his final season. so, naturally, one of our first stops when we visited last weekend was to the joepa statue at the stadium. we didn’t bring the flowers. amy told us they have been omnipresent since the fall. we arrived on friday afternoon and kicked off the fun with a nice dinner out with aunt amy and uncle nick! then we squeezed into one car, leaving uncle nick behind, and headed to campus for a gymnastics meet. phoebe was especially thrilled to be there. it was like a circus, with girls jumping and flipping around, and so many places to look for action! it was an exciting competition, and penn state pulled out a win with the team’s final event, the floor exercise! on saturday, we walked around downtown, did some shopping, had lunch at the corner room, and topped off the afternoon with a trip to the creamery, of course! thanks to amy and nick for their never-ending hospitality. we all had a great time, and can’t wait for blue-white weekend so we can visit again! here’s what I love about my husband – I have an idea, I show it to him, and he always finds a way to make it happen. whether it’s a new patio in our backyard, a window-mounted seed starter kit for our vegetable garden, or silly-cute valentine cards for the kids, he looks at it, figures it out, and then does it! what a guy! jackson handed out 34 of these babies to his classmates, teachers, and principals today, after hand-writing his name on the back of each. it seemed daunting at first, but when he was finished, he was so proud! and speaking of proud… phoebe was pretty excited about her valentine breakfast this morning – heart-shaped pancakes with red, ripe strawberries! hooray! happy valentines day, everybody! we love you!! you guys are SO STINKING CUTE!!! We love all of you too!! when I was a little kid, halupki were a staple in the fellin family’s diet. pretty frequently, the little beauties would be boiling away in a pot on the stove, and the ketchup would be set out on the table, and then it would be time to stuff our faces with stuffed cabbage. it wasn’t until high school that I realized many people had no clue what halupki was. and in college, I got a few strange looks when I would bring up the topic. but when I think of halupki, I always think of family, especially my mom. even though I love to eat them, I have never actually made halupki myself. enter my mother, who asked in a phone call whether I’d like her to make a batch when she visited in late january. she didn’t even have to ask the question! I wasn’t the only one excited when patsy got working in the kitchen. dave has always been a big fan of all of my mom’s cooking. and halupki is no exception! my mom was working so furiously, it was all I could do to scratch down the ingredients and directions as she worked and talked. I grabbed the closest piece of paper and tried to keep up! we ended up with something like 3 dozen halupki. and when she was all done, and the halupki was either eaten or put in containers in the freezer, nana got on her cozy pajamas and snuggled up to her little friend, phoebe! What great memories–new and old! Thanks for the walk back in time. Flashbacks of Anna’s pirogue-making lessons. Keep the traditions going! AWESOME!!! Hope you saved me some!! Mom keeps saying she’s gonna teach me how to make them…I’m looking forward to it!! Awesome! This is such a great thing to do to keep the tradition going! 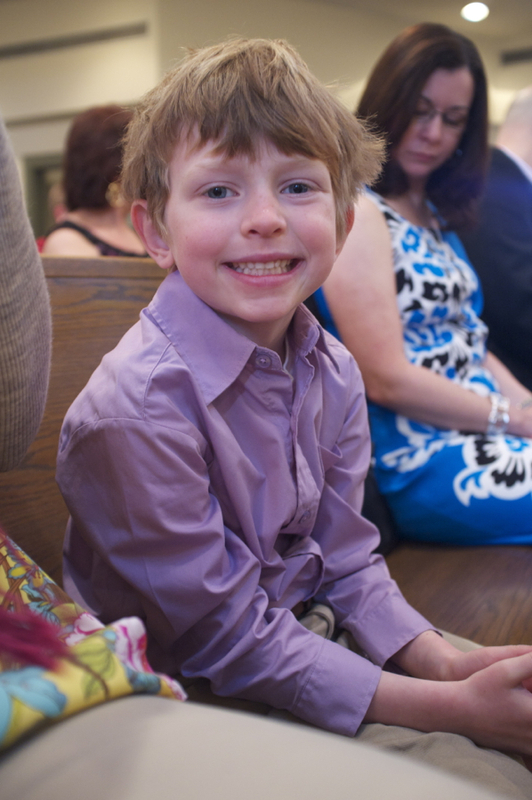 Hey Jackson – great job on the reading. Do you read to Phoebe every night? She looks like she likes it. Thanks to Mom and Dad for sharing the video.